Answer: So that everyone knows what we’re talking about, let me first say that the terminator is the dividing line between the lit and unlit parts of the Moon. I should also point out that the unlit part of the Moon is not in Earth’s shadow, as is sometimes mistakenly believed. In the photo above, the Sun is way off to the right, out of frame. The Moon is roughly spherical, so the Sun illuminates the half that faces it, but can’t reach the opposite hemisphere. Well, at least not directly. If you can see any details on the unlit side, as you can in this photo, it’s because of earthshine. 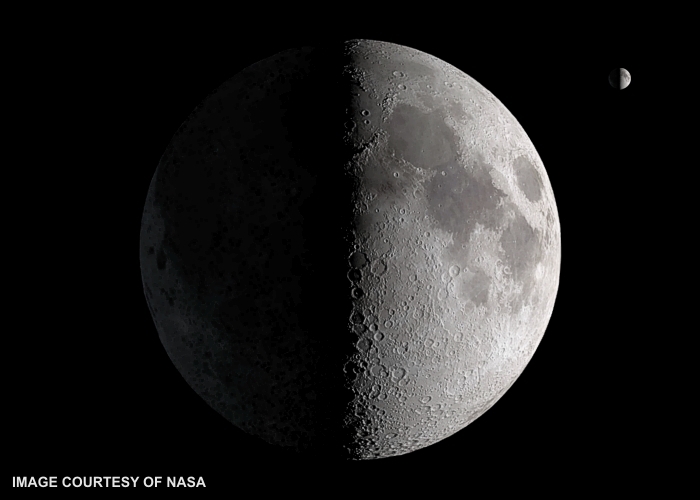 The terminator can also be thought of as the line between day and night on the Moon. Over a period of 29.3 (Earth) days, this line moves from west to east across the lunar disc. In the process, it creates the well-known sequence of phases: New, Crescent, Quarter, Gibbous, Full. Following the Full Moon, the sequence repeats in the reverse order. We prefix those phases with either waxing (the lit part is growing) or waning (the lit part is shrinking). There’s a nice graphic of the whole phase sequence here. That all said, I can finally get to your question. What you saw was not particularly unusual. For the terminator to be exactly straight, you have to catch the Moon within a few hours of its Quarter phase (aka half moon). Otherwise some curvature of the terminator will be visible to the eye. And the human eye is very good at detecting even slight curvature. The razor-sharpness you described was due to what astronomers call seeing. That’s a measure of the transparency and steadiness of Earth’s atmosphere, and there’s considerable variation in seeing from night to night. From space, far above Earth’s atmosphere, seeing is perfect and the terminator always appears razor-sharp. Observing from Maine does make a difference. It adds the advantage of having very little dust in the air (compared to my Desert Southwest). With a good sea breeze blowing inland, your air can be extremely clean and have excellent seeing. There’s one additional factor. As you can see in that highly magnified photo, the terminator is definitely not a straight line. Because of mountains and valleys on the Moon, sunlight reaches places beyond (and short of) what it would on a perfectly smooth sphere. But it’s tough to make out those details using just your eyes. If you were on the Moon, in the area of the terminator, your view would look much like this. What your eyes see is more like the reduced copy of the Moon in the upper right corner of that photo. The terminator looks much more like an exact line at that level of magnification. I sized that copy to look about as big as the Moon does in the sky (0.5°). Of course, what you see depends on how big your monitor is, and how far you’re sitting from that monitor, but it’s close enough to show the effect I’m talking about.